Great Scott! 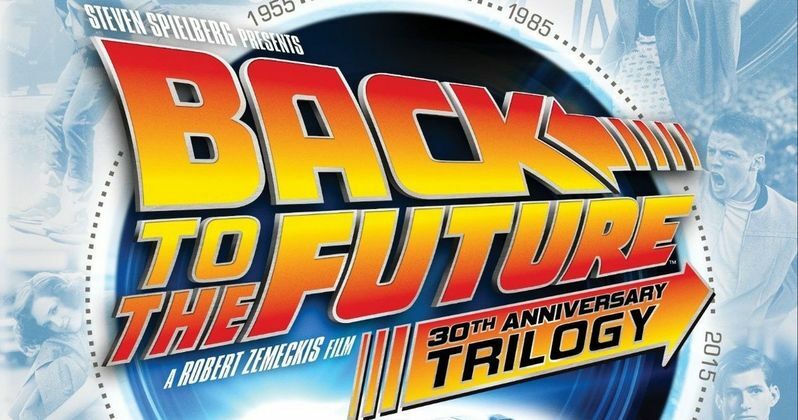 In 1985 Director Robert Zemeckis, Executive Producer Steven Spielberg and Producer/Screenwriter Bob Gale embarked on a three-part journey through time that broke box-office records worldwide and catapulted Back to The Future into one of the most beloved trilogies in motion picture history. In 1989, the filmmakers gave us a glimpse of the future in Back to the Future Part II as Marty McFly and Doc Brown traveled to 2015...or, if our calculations are correct, October 21, 2015, to be exact. "The Future" has finally arrived. Now, Universal Pictures Home Entertainment celebrates this once-in-a-lifetime date, as well as the 30th Anniversary of the groundbreaking first film, with three new releases debuting on October 20, 2015. Available on Blu-ray & DVD, the Back to the Future 30th Anniversary Trilogy will include all three movies plus a new bonus disc with more two hours of content. Back to the Future: The Complete Animated Series will be released for the first time ever on DVD featuring all 26 episodes from the award-winning series and Back to the Future: The Complete Adventures will include all three movies, the complete animated series, a new bonus disc, a 64-page book and collectible light-up "Flux Capacitor" packaging. Featuring more than two hours of content, the bonus disc will include all-new original shorts, documentaries, two episodes from the animated series and more. In addition to the home entertainment release, the Back to the Future celebration continues in theaters when the films go back to the big screen on October 21, 2015. Check local listings for show times. Additionally, Universal Music Enterprises is reissuing an all-new 30th Anniversary picture disc vinyl soundtrack, available October 16th in stores and through all digital partners. Check out all the official details on these new Blu-ray & DVD sets below. The set includes Back to The Future, Back to the Future Part II, Back To The Future Part III, a Bonus Disc with More than Two Hours of Content, Digital HD with UltraViolet (Blu-ray Exclusive) and Collectible Packaging (Blu-ray Exclusive). The bonus features include All New Original Shorts: Including Doc Brown Saves the World!, starring Christopher Lloyd, OUTATIME: Restoring the DeLorean: An inside look at the 2012 restoration of the most iconic car in film history and Looking Back to the Future: A 9-part retrospective documentary from 2009 on the trilogy's legacy. There are also two episodes from the Back to the Future: The Animated Series, featuring live action segments with Christopher Lloyd as Doc Brown, Tales from the Future 6-Part Documentary, The Physics of Back to the Future and Deleted Scenes. The bonus features are rounded out by aMichael J. Fox Q&A, Eight Archival Featurettes, Behind the Scenes Footage, Music Videos, Audio Commentaries and Back to the Future: The Ride. It's about time! The adventures continue with all 26 episodes of the award winning Back to the Future: The Complete Animated Series, in its entirety and uncut! Join Marty McFly and Doc Brown, Doc's wife Clara, sons Jules and Verne, and dog Einstein for more hilarious escapades as they time travel to Prehistoric Hill Valley, Ancient Rome, Medieval England, the Civil War, the days of the pirates, the far future and beyond. Featuring live action segments with Christopher Lloyd as Doc Brown, science experiments by Bill Nye the Science Guy and the vocal talents of Mary Steenburgen (Clara), Thomas F. Wilson (Biff) and Dan Castellaneta (Doc), it is family entertainment at its best and a true treasure for all Back to the Future fans! Bonus Features include Drawn to the Future: New interview with creator/writer Bob Gale and writer John Ludin and rare archival materials featuring character art, DeLorean designs and more. Great Scott! For the first time ever, Back to the Future: The Complete Adventures pairs together the original beloved trilogy starring Michael J. Fox and Christopher Lloyd along with the complete TV series. Join Marty McFly, Doc Brown and a time traveling DeLorean for the adventure of a lifetime as they travel to the past, present and future, setting off a time-shattering chain reaction that disrupts the space time continuum. The set includes Back to The Future, Back to the Future Part II, Back To The Future Part III, Back to the Future: The Complete Animated Series DVD, a Bonus Disc with More than 2 Hours of Content, Digital HD with UltraViolet (Blu-ray Exclusive), Back to the Future: A Visual History 64-Page Book and Light-Up "Flux Capacitor" Packaging. Check out the trailer and artwork for all of these sets below.